This article is about the novel. For the film, see The Princess and the Goblin (film). The Princess and the Goblin is a children's fantasy novel by George MacDonald. 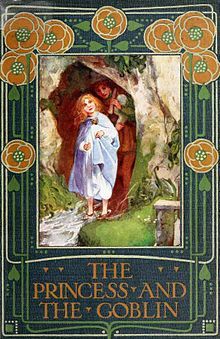 It was published in 1872 by Strahan & Co.
Anne Thaxter Eaton writes in A Critical History of Children's Literature that The Princess and the Goblin and its sequel "quietly suggest in every incident ideas of courage and honor." Jeffrey Holdaway, in the New Zealand Art Monthly, said that both books start out as "normal fairytales but slowly become stranger", and that they contain layers of symbolism similar to that of Lewis Carroll's work. In the 1960s, the novel was adapted in animated form by Jay Ward for his Fractured Fairy Tales series. This version involved a race of innocent goblins who are forced to live underground. The goblin king falls in love with a princess, but a prince saves her by reciting poetry because goblins hate it. A full-length animated adaptation of the book, directed by József Gémes, was released in 1992 in the United Kingdom, and in June 1994 in the United States. This Hungary/Wales/Japan co-production, created at Budapest's PannóniaFilm, Japan's NHK, and S4C and Siriol Productions in Great Britain, starred the voices of Joss Ackland, Claire Bloom, William Hootkins and Rik Mayall. The film's producer, Robin Lyons, also wrote the screenplay and voiced the Goblin King. However, it was not well received commercially nor critically upon its US release from Hemdale Film Corporation in summer 1994, reportedly grossing only $1.8 million domestically and receiving mainly negative reviews (compared to Disney's very successful The Lion King that was released during the same month in the United States). The film's title is "De Prinses van het Zonnevolk" in Dutch (English: The Princess of the Sun-people), "Prinsessan og durtarnir" in Icelandic (The Princess and the Trolls), and "La princesse et la forêt magique" (The princess and the magic forest) in French. The Princess and the Goblins is also a poem by Sylvia Plath (1932–1963). Shirley Temple played Princess Irene in a production on an episode of her television show. Although the plot follows the basic outline of Macdonald's story, it glosses over the darker elements and is played primarily as comedy. 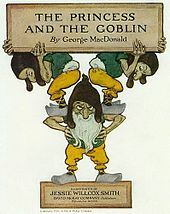 Irene and Curdie are portrayed as young adults instead of children (with hints of a budding romance), and the goblins are forgiven their evil deeds and reform. It was a book in the "100 Classic Books" collection for the Nintendo DS. Twyla Tharp used the story in the full-length ballet of the same title. It was her first to incorporate children and was co-commissioned by Atlanta Ballet and Royal Winnipeg Ballet in 2012. The sequel to this book is The Princess and Curdie. 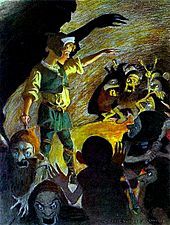 J. R. R. Tolkien's depictions of goblins within Tolkien's legendarium was heavily influenced by the goblins within The Princess and the Goblin Tolkien 2003, pp. 108. In C. S. Lewis' novel That Hideous Strength, Elwin Ransom says that he lives 'like the king in Curdie', and later in the novel, Jane Studdock reads the 'Curdie books'. ^ Eaton, Anne Thaxter (1969). Meigs, Cornelia, ed. A Critical History of Children's Literature. Macmillan. p. 200. ISBN 0-02-583900-4. ^ Holdaway, Jeffrey (August 2005). "Eight Important works". New Zealand Art Monthly. Archived from the original on 7 March 2009. Retrieved 18 January 2009. ^ "Behind The Voice Actors – The Princess and the Goblin". Behind The Voice Actors. ^ Seibert, Brian (12 February 2012). "Toe Shoes That Carry a Princess to Victory". The New York Times. Retrieved 3 March 2012. Wikimedia Commons has media related to The Princess and the Goblin.